WHAT do we say about a day like Stage Four on the 2017 Ras? The race started like it finished yesterday – a frantic pace with close to 50km covered in the first hour – the speedometers were touching 90kmph at one point coming into Letterkenny. The team had four riders in the main bunch on reaching Buncrana for the first time (110km) and it was there that the climbing started in earnest, five categorised hills to culminate atop the mighty Mamore Gap. Adam Greally held it together when the race went up in pace and intensity and finished with some illustrious company. His performance on those mammoth climbs has to go down as one of the best rides the club has seen. This is a small club in a professional race, but that was no small, nor amateur ride. Mamore Gap was on everyone’s minds all day and will be for along time due to more than its difficulty; The atmosphere there was incredible. 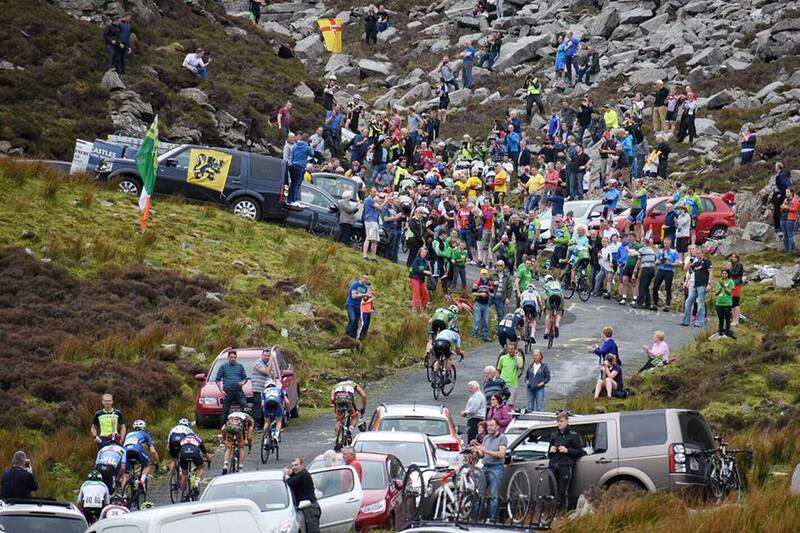 It’s not often you see a climb lined with people like that in Ireland. There was plenty of support for the team on the climb from unidentifiable members and associates! Some who were identifiable were Richie Gallagher’s parents coming out to support the club, thanks to them! With Glengesh now looming on Thursday, after a 181km stage in Donegal tomorrow, the team are looking forward to more of the same. Maybe the biggest success of the race thus far was not Matt Teggart’s yellow jersey but James Quinn’s foray to the front of the bunch to sit on Sean McKenna’s wheel. The gravity of this is huge: two of the last three ICL winners wheel to wheel…emotional stuff. Satisfaction and relief are the current mood. We are over halfway once the pedals start turning tomorrow morning. The support from manager Justin, mechanic Lawrence and swanny Amanda has been amazing. Lawrence fully servicing each bike every night, Amanda having recovery meals waiting in everyone’s rooms off the bike, and Justin controlling a clutch in a way Marc Madiot would be proud of. No Replies to "Ras 2017: Stage Four - The meeting of Mamore"